Whitefield Pattandur Agrahara, Bangalore, India- 560066. I am Â lifestyle fitness coach and founder of Practical Fitness . I believes fitness is a not a destination but a way of life. 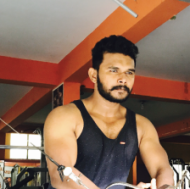 I am a qualified personal trainer with CPT certification from ACE , ISSA ,and diploma in physical education - TRX , Pilates instructor based in Bangalore and offers expert personal training services throughout Bangalore .I have experience of 7 years in fitness training and weight management .I trained famous personalities in film industry ,athletics and also people with different medical conditions. As a Practical personal trainer ; an expert in designing and implementing dietary programs based on each clients individual requirements. My strength lies in understanding my clients needs and formulating tailor made training and workout programs for my personal trainer clients. My programs include weight loss, muscular gain, core strength and also rehabilitation. With my expert knowledge of Pilates routines, I am specialised in posture correction and core strength. I believe a person should use their own body weight to perform any kind of exercise to gain health and fitness in the right way. My MHR based programs will help a person to build for muscle finer and loss more internal and Exeter all fat and prevent all kind of lifestyle diseases. my practical theories of weightloss will help u to loss fat in a easy way. I provide 1 free demo at your place . We can discuss all pricing after the demo session.-and choose a perfect program for you. "I started to train under Seby for 2 months.To say he is an absolute pro at his job is an understatement.He is someone who is as observant , skillful and knowledgeable.For him itâ? ?s just not a job but away of life.Under his training I have seen my body transform.His focus and encouragement pushes you to try harder. Seby explains the scientific reasons for doing each and every exercise.I would say he would be going a long way in the fitness industry. " Thank you somuch for your valuable review. "I am very satisfied with his training, I have never undergone a motivating training like this before, I have lost 7.6 kgs in 5 months. Thank you Seb. " "Sebastian is a very good personal trainer. He is helping me achieve my fitness goals in a methodical and healthy manner. " "It has been more than a month with Seby as my PT, and I am feeling the change in my body and approach towards my health. Very experienced and knowledgeable about his subject (body, health, training). There is a long way to go with Seby and learn a lot from him. " Seby P describes himself as Fitness Trainer. He conducts classes in Aerobics, Gym and Personal Trainer. Seby is located in Whitefield Pattandur Agrahara, Bangalore. Seby takes at students Home and Regular Classes- at his Home. He has 7 years of teaching experience . Seby has completed Bachelor of Science (B.Sc.) from MG UNIVERSITY in 2014. He is well versed in Spanish, Kannada, Malayalam, Telugu, Oriya, Marathi, Bhojpuri, Punjabi, Gujarati, Bengali, German, Arabic, Assamese, Hindi, Tamil, English and Italian. Seby has got 7 reviews till now with 100% positive feedback.